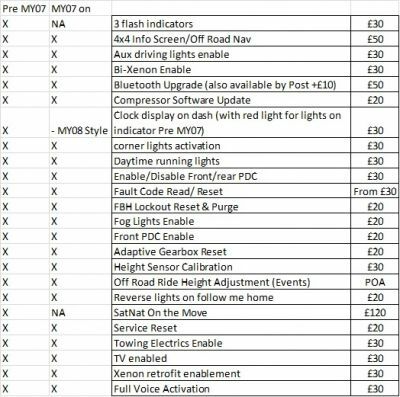 As many of you know, I have the Faultmate MSV2 as a Multi-Vehicle licence, which means that I can do many updates to your Discovery 3. Either enabling features that you didn't have before (such as 4x4 info/off road nav) or updating software such as the latest compressor software to reduce the pressure or the more popular one which is to update the software of your factory fit Blutooth Telephone module. Along with many other features or updates that can be enabled. To that end, please find below the prices for the relevant services. Usually there would be a minimum charge of £75 for updates, I can be flexible for Club Members where it makes sense. If (for example) there were a number of members that wanted to get to one location for some updates, then I can arrange specific pricing for that at the time. Likewise, some combinations of updates can also be more easily combined for members. Similarly I can install and enable retro fit PTI modules if your vehicle didn't have them. (Only for those with HiLine Radio) P.O.A. for parts & Labour. What's the 'TV enabled' ? You need to get the tv module and wire it and most cabling. Haven't done one of those yet tbh, but am researching it for when I get my rse headrests!